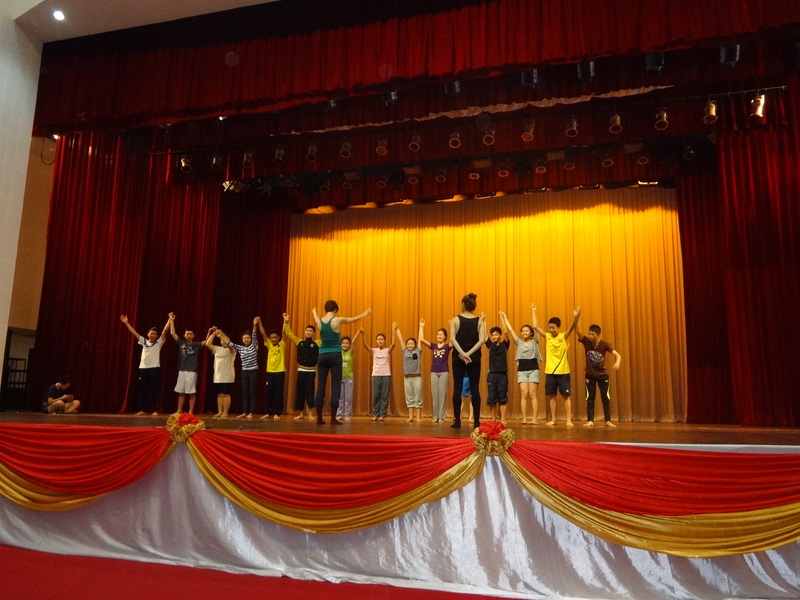 In late June of 2013, Battery Dance Company had the opportunity to visit Vientiane, Laos. 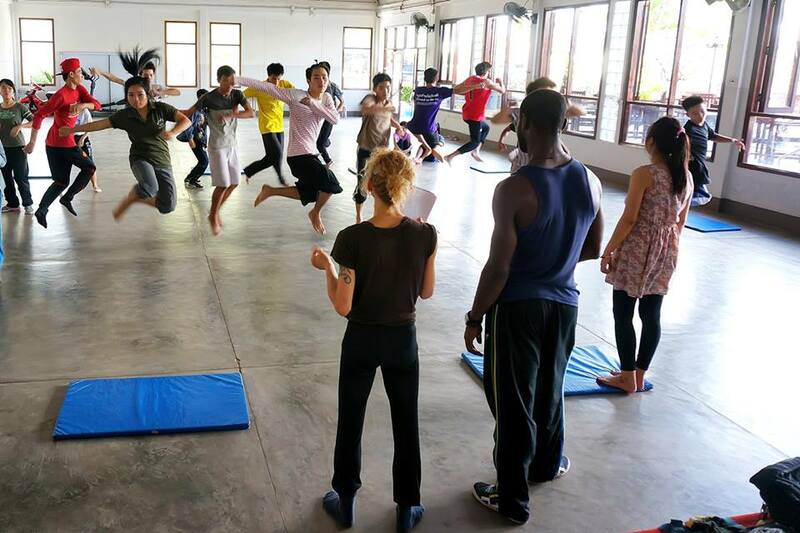 With sponsorship from the U.S. State Department and partnerships with Lao Bangfai and COPE Center, the company was ready to lead Dancing to Connect workshops with local dancers. 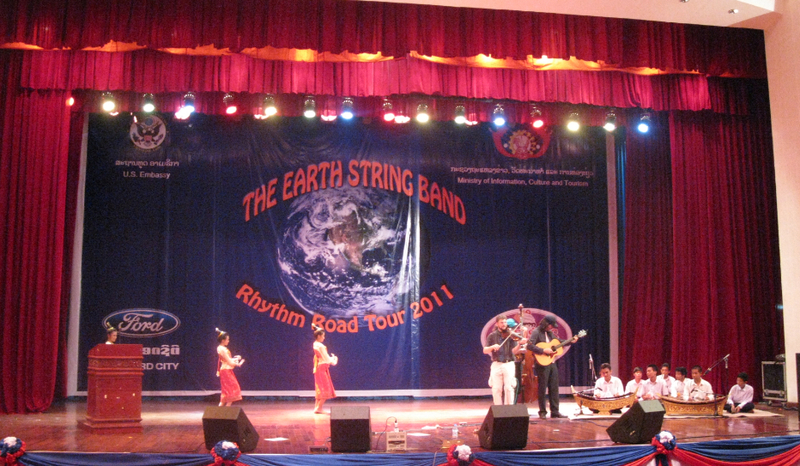 As a second tour to Laos, it provided a special opportunity for the company to run a longer program with more outreach than the initial tour in 2008. The tour faced a series of stumbling blocks from the very beginning but despite the struggles and snags, the program was a huge success. In addition, the company felt welcome and at home with the incredible staff from the Embassy. One of the workshop groups was with the English language students from the Embassy sponsored class. They were a group of very special children who demonstrated dedication and high intellectual capability. The Embassy sport room also served as the venue for the group. Led by Robin Cantrell and Mira Cook, the twenty participants had a wonderful time exploring movement, performance and the English language used in an entirely different capacity. Additional support from Embassy interns was readily on hand offering translation, encouragement and enthusiasm. The other two groups experienced some organizational difficulties and eventually became one group. Cope Center is a wonderful space providing rehabilitative services for victims of UXOs. (Unexploded Ordinances) In addition, the center has a museum that provides visitors with information building awareness of the problem of unexploded bombs. The Lao Bangfai group was to work with Clement Mensah alone, however, combined with the group from Cope Center initially led by Carmen Nicole Smith, the two groups became one. The combined group at Sengdara was about twenty-eight participants and in the end turned out well. The final performance day at the National Cultural Hall went off without a hitch minus the lack of air conditioning. Thankfully it came on just as the audience was settling down. The house was about two-thirds full, a great turnout for such a large venue. The company had made some local friends who also attended the performance providing further evidence of community outreach. 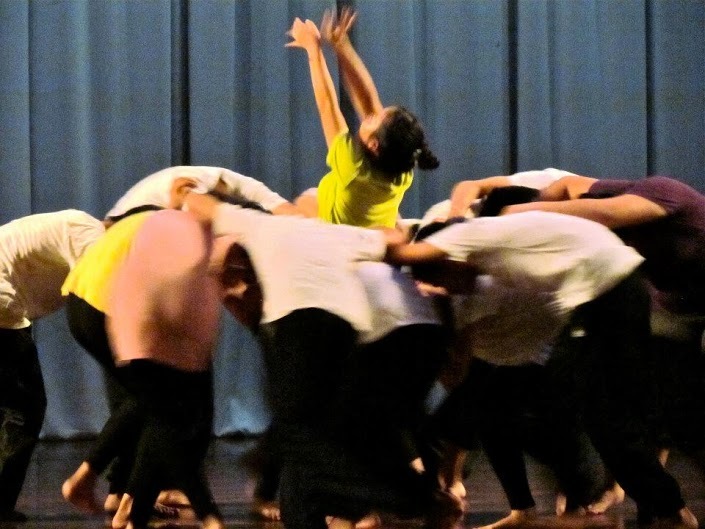 The company performed a variety of repertoire pieces along with the two Dancing to Connect groups and Peter Kim’s piece. The attendance of the U.S. Ambassador at the performance was an honor. The spirit of the audience was lively and embracing, similar to the company performance in 2008. As a lovely closing to the week’s efforts, the Embassy sponsored a dinner for all the participants at a very popular pizza restaurant. Little did the company realize the dinner would also be a lesson in Laotian popular culture. Unlike typical American or European style pizza with unsweetened tomato sauce and a select variety of meats, cheeses and vegetables, the Laotian version had a vast array of meats from cocktail franks to shrimp. To go along with the already very sweet tomato sauce, diners use liberal amounts of ketchup and sweet chili sauce on their pizza. It was a discovery that our company members enjoyed experiencing. Prior to departing, the company had a chance to see some of the wonderful sights in Vientiane. The temples and Buddha’s left an indelible impression. Again, the chance to return was a special opportunity to witness the rapid growth of the city. Restaurants and businesses, a vision in 2008, now line the streets with new development all around. Local people were open and eager to talk to company members and surprisingly, many locals the company met had at one point or another visited the US or had relatives there. 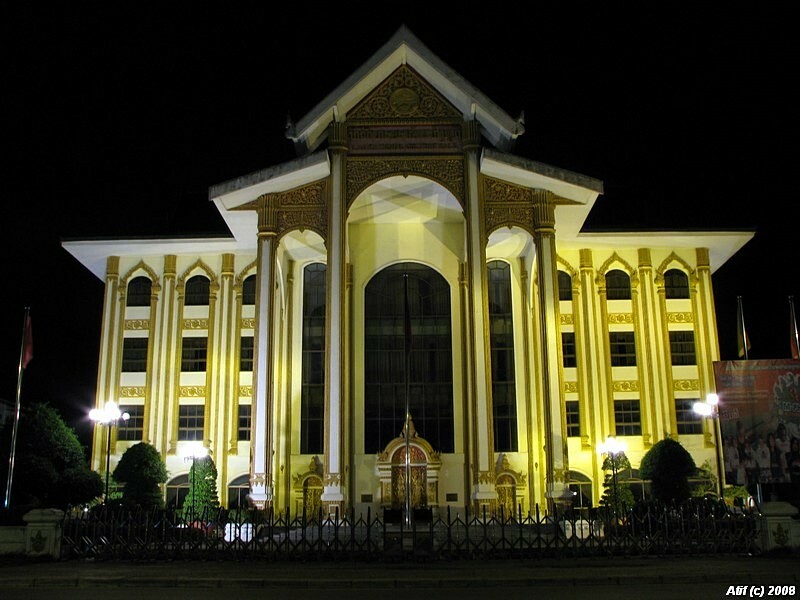 The shift in Vientiane is also made clear by the number of expatriates or the vast number of European backpackers visible in the town. It was encouraging to see local men and women alike embracing the entrepreneurial spirit setting up shops, juice cafés and restaurants. Often a culture can get lost with such swift economic growth, but thankfully, the majority of stores still sell the local artisan crafts, silk work and cuisine. The company hopes for the opportunity to return in three or four years to witness further changes and reconnect with participants. Perhaps they will have dance companies, be teaching English, or running businesses of their own.